Stavi’s take from the financial/gambling side of life. Remember to follow us on Twitter @Stavster91 and @DRosesAndThorns for updates! We built a relatively comprehensive model that combines advanced NBA metrics from NBA.com and Las Vegas market information. Please let us know if you find it helpful! Want the excel file and some sleepers for today? Email me at drosesandthornsnba@gmail.com! Sign up for HotRoster here using promo code dfsmasters ! We are only asking for one thing in return for our analysis and hard work…YOUR CONTINUED SUPPORT TO THE COMMUNITY!! We would appreciate the referrals for FanDuel, DraftKings or Fantasy Draft if you feel inclined to do so!! DISCLAIMER: Steve is excited to announce he is a part of the HotRoster Team effectively immediately (and on the payroll). 1) Steve is not playing ANY DFS effective immediately 2) Steve’s thoughts and ideas are his OWN, and not the company’s 3) INVEST AT YOUR OWN RISK – YOU ARE RESPONSIBLE FOR YOUR OWN MONEY..NOT OURS!!!! The information contained on this site is for entertainment purposes only. The site owner can’t be held responsible for any user activity that violates any local or national laws or jurisdictions. It is solely your responsibility to ensure that online gambling is legal in your jurisdiction. We cannot determine the legality of online gambling in every jurisdiction, and cannot provide any legal advice. Online gambling and gaming is illegal in many jurisdictions and users should consult legal counsel regarding the legal status of online gambling and gaming in their jurisdictions. The information at this site is for news and entertainment purposes only. Use of this information in violation of any international, federal, state or local laws is prohibited. Recently, the “Unlawful Internet Gambling and Prohibition Law” was passed by Congress and signed by the President. For US residents, it is illegal for any payment processor to accept real money transactions for use on gambling sites. If you’re a US citizen, please note that online gaming (as defined by the current bill referenced above) is prohibited. Using any link or reference from this site to conduct a real money transaction with the intention of gambling online with that money is illegal. The site owner can’t be held responsible for such acts. The visitor does so at their own risk. We built a relatively comprehensive model that combines NFL DVOA metrics from FootballOutsiders.com and Las Vegas market information. Please let us know if you find it helpful! Want the excel file and some sleepers for Week 13? Email me at drosesandthornsnba@gmail.com! DISCLAIMER: Steve is excited to announce he is a part of the HotRoster Team effectively immediately (and on the payroll). 1) Steve is not playing ANY DFS effective immediately 2) Steve’s thoughts and ideas are his OWN, and not the company’s 3) Steve is NOT making any specific HotRoster recommendations or commenting on the pricing of players on ANY DFS Site 4) INVEST AT YOUR OWN RISK – YOU ARE RESPONSIBLE FOR YOUR OWN MONEY..NOT OURS!!!! Sign up for HotRoster here using promo code DFSmasters for an up to $25 match! I show YOU how I go about analyzing a NBA box score to give you a different edge/perspective for DFS and Fantasy Basketball! Feel free to donate to our quest for DFS/Fantasy Sports supremacy, we appreciate any and every contribution… thank you for your generosity! Click here for our YouTube FanFunding Page. I am excited to announce I am a part of the HotRoster Team effectively immediately (and on the payroll). 4) INVEST AT YOUR OWN RISK – YOU ARE RESPONSIBLE FOR YOUR OWN MONEY..NOT ME!!!! I built a relatively comprehensive model for evaluating starting pitchers. Please let me know if you find it helpful! Want the file? Email me at drosesandthornsnba@gmail.com! 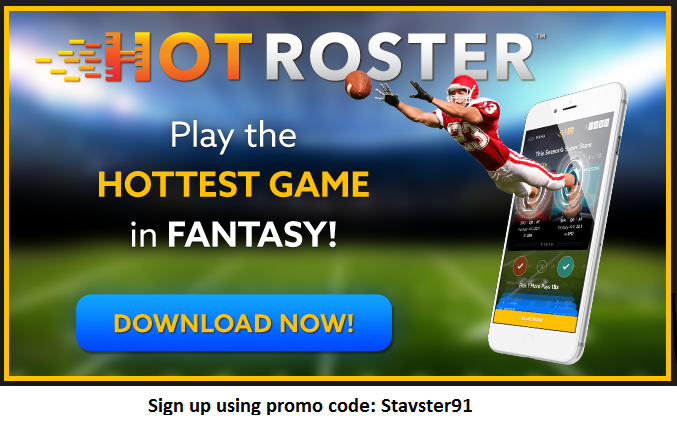 Sign up for HotRoster here using promo code Stavster91 ! 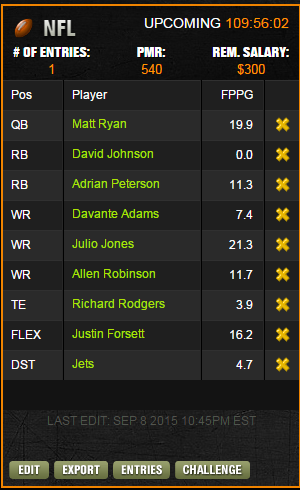 Want #DFS lessons? Email me at drosesandthornsnba@gmail.com for details! Feel free to donate to our quest for NBA and NOW MLB gaming supremacy, we appreciate any and every contribution… thank you for your generosity! Click here for our YouTube FanFunding Page. I built a relatively comprehensive model for evaluating starting pitchers for MLB. Please let me know if you find it helpful! Want the file? Email me at drosesandthornsnba@gmail.com! 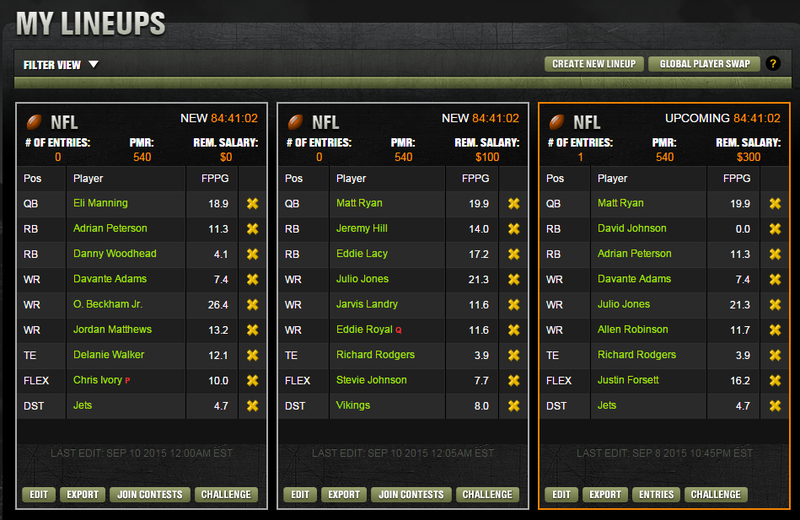 Sign up for DraftKings here!! There is almost 100% certainty that these lineups will change. I will do my best to update them as frequently as possible. But, there are no guarantees!! Remember, YOU are responsible for your money.